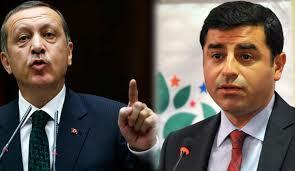 Erdogan thought that the only way to make the pro-Kurdish party, guided by Selahattin Demirtaş, lose the incredible support received last June was to call for new elections and in the meantime reinstate the war against PKK. But someone or something suggested him that it could not be enough to win this life-or-death political struggle with the HDP. The Ankara massacre has to be read with these lens. The break of the truce with the PKK, the Kurdish nationalist organization, after the last elections had a clear goal to make Turkish people afraid of instability and even a possible civil war, and so vote in big numbers for the nationalist and Islamist AK party. Erdogan, since got the power in 2002, has the plan to build a new powerful regional Middle Eastern Turkey, on the old Ottoman style example. He needs the support of the majority of the population to do that, with the creation of a strong presidential system through a Constitutional reform. But his plan has been blocked by the surprising success of the People’s Democratic Party (HDP) a leftist secular and inclusive party, born in 2012, that supports the Kurdish cause and has anti-capitalist, environmental and pro minority rights identity. This party represents a real threat to the AK party goal, as it challenges basic foundations of the new strong Turkey with an Islamist identity, that Erdogan wants to create. Among other things the HDP guarantee a 50% quota to women and 10% to LGTB community, and geopolitically supported the peace process with the PKK party for more autonomy to the Kurdish region. The secular and modern soul of Turkey, the same soul that helped Tunisia to avoid the creation of an Islamist state, completing the only successful democratic transition in the Arab Spring, could not have died in just a decade of AK rule. The winning of HDP demonstrates it. When this party became the third parliamentary force in Turkey last June, Erdogan understood that he could not make his goal real. He started to revive the war between Turkey and Kurdish militants in order to break the alliance between liberals and Kurds that allowed the HDP party victory. But something or someone told him that this was not enough. The recent attack in Ankara against HDP supporters (also two HDP candidates died in the attack) could show that he might have turned to a strategy that in Italy we have known for long time, since the 1970s (when the state used it against the risk of a strong Communist Party): the “strategy of tension”. Actually the Ankara massacre remembers me the famous Bologna massacre at the train station in 1980. There is a difference with Italy though: after the Bologna massacre the broken clock of the station that stopped at 10.25am was left as a symbol of the massacre. After the Ankara bombings the government rushed to clean the place and fix the destructions of the station to go back as soon as possible to normality, and erase any sign of the attack avoiding any possible memorial symbols. Will a memorial monument be built in the place of the massacre? This is the parameter to understand if Turkey will have reached a social peace in the future. The “strategy of tension” occurs when the “deep state” of a country give the “go ahead” to some acts of violence and terrorism in order to create a climate of fear in the population, bringing it towards more right wing and nationalist positions, to support parties that guarantee the status quo with a strong hand. For Erdogan would not be difficult to allow DAESH cells to act on its territory, as Turkey has been helping in some way DAESH to form in Syria and Iraq (against the Shia ruling in both countries). But this strategy, if is the one Erdogan is really pursuing, could not work in Turkey today, and on the opposite could even turn against not only the AK plan but also against the Turkish future. The reason is that the situation of Kurdish minority is not a Turkish national problem: it is a regional problem. Since the Treaty of Lausanne Kurdistan is divided between four states: Syria, Iraq, Iran and Turkey. And today the DAESH’ success on the dismemberment of the Syrian and Iraqi states works in favor of a possible final creation of a Kurdish state. When (in few years or in a decade we don’t know) Iran, Turkey, Egypt and Saudi Arabia, with the presence of Russia, the US, the EU and may be China, will finally seat at an international conference to decide the destinies of the Levant region, after the end of post-Ottoman order, a Kurdish state will have to be built, to answer to the need of self determination of a population since more than one century. And Turkey will have to accept it, and deal with it may be even giving some part of its national territory to the new state, as more than half of the Kurdish population lives in Turkey today. What could be done otherwise, a forced migration of 15 million people? Fortunately a genocide like the one against Armenians one century ago is today unthinkable. Therefore the strategy used today by the AK party to securitize the Kurdish issue and cut the support to the HDP party, could represent a mistake for the future of Turkey. To block the HDP from having rallies for fears about security, to restrict media freedom and to exacerbate the conflict with Kurdish population can only go against Turkish democratic and unity interest. While starting a new inclusive policy, in which also the Muslim Kurdish minority would be integrated in the state besides the non-Muslim minorities that have already a legal status in Turkey since one century (the Armenians, Greeks and Jews) would facilitate a social peace that is the only path for a stable future. Unfortunately leadership with long vision is what is missing today, also in the Middle East (a part may be from Iran, who not by chance has been called back by the international community to help to solve the Middle East quagmire). We will see what will happen in the next elections in November in Turkey, unless Erdogan will stop them for some more months, as he has the Constitutional right to do so in case of unrest and insecurity. What will be the result of those elections? What will do the Army in case of a too polarized result, intervene like they already did in the past? Is Turkish democracy a healthier one today? The Turkish people could demonstrate this in two weeks, voting for the parties that look for national dialogue and inclusiveness instead than for the ones that call for divisive nationalism and strong state. One thing is certain: the blood spilled in Ankara will not be forgotten soon, neither by the Kurdish nor by the Turkish youth. And this is not a good news in the long term for the AK party. PS It is better to call the Salafi jihadist extremist militant group present in Syria and Iraq with the correct Arabic acronyms for this criminal organization based on a destructive cult that wants to create a Caliphate: DAESH. This because to use the English terms ISIS/ISIL/IS or “Islamic State” supports the propaganda of DAESH, who aspire to represent the Islamic world (that nobody of common sense in both Islamic and non-Islamic world would agree on) and aspire to have a state (that also nobody of common sense should support).